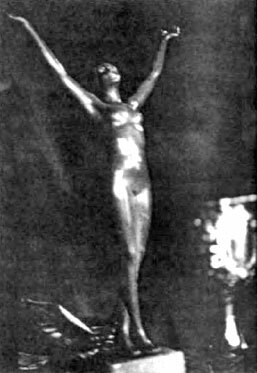 The arms raised with the palms of the hands facing forward is a supplicatory gesture, meaning passive acceptance, surrender, or an appeal for mercy. 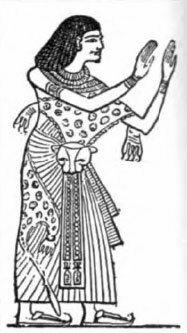 Caesar, in his Gaelic Wars, noted the use of this sign by Gaelic women, who apparently were signaling subjection to, or acceptance of, their Roman conquerors. "Thank you O Subterranean Lord for your deceptive wisdom and for your cunning aid in our struggle to overcome our enemies and to effect the Great Work." 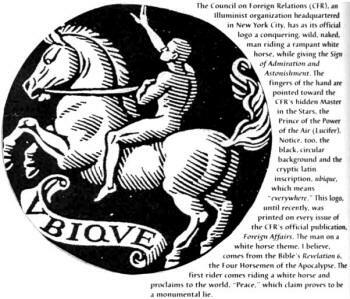 As we shall see in this chapter of Codex Magica, this sign has been displayed in public media by Presidents, presidential candidates, Prime Ministers, and many other VIPs throughout history including the Emperor of France, the Freemason Napoleon Bonaparte. Clinton the Devil, President of the U.S.A.
President Bill Clinton was named Time magazine "Man of the Year" in 1993. On the Time cover making the announcement, President Clinton's head was pictured with the "M" in the Time masthead of the magazine stretched and appearing to be two horns on Clinton's head.3 Were the magazine's editors telling us that Clinton is the devils' man, or was it some strange coincidence? Even more weird and dramatic, inside that same issue was a photo of Clinton in his Oval Office holding his hands and arms in the Masonic display of the sign of admiration. Now, get this: carved on the President's desk in the Oval Offices directly in front of Clinton is the eagle, in the presidential seal or logo, with its face turned to the left. But on the carpet just in front of the desk one finds the presidential seal facing toward the right: Two eagles, each facing in the opposite direction. This is clearly the double-headed eagle of Freemasonry, a symbol representing the Serpent, honored as the Sun God in the Mystery Religions with its eagle-like, all-seeing eye. In other words: Lucifer! Solar God of Bill Clinton and the Illuminati. 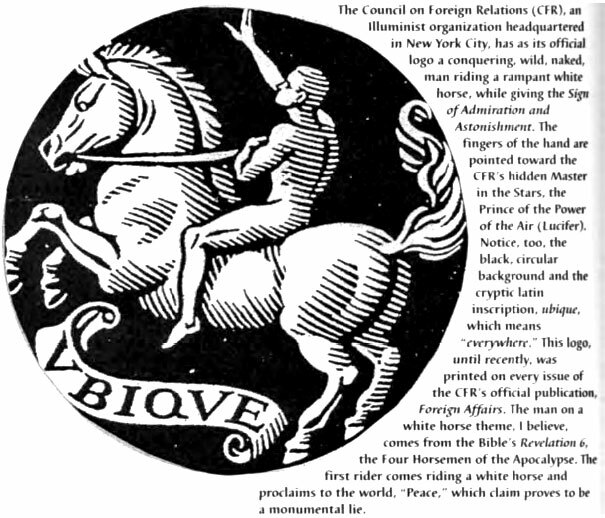 Meanwhile, in Clinton's left hand (see page 183 below of Codex Magica) is a rose —sign of the Illuminati's blood covenant and the Rosicrucian Order. 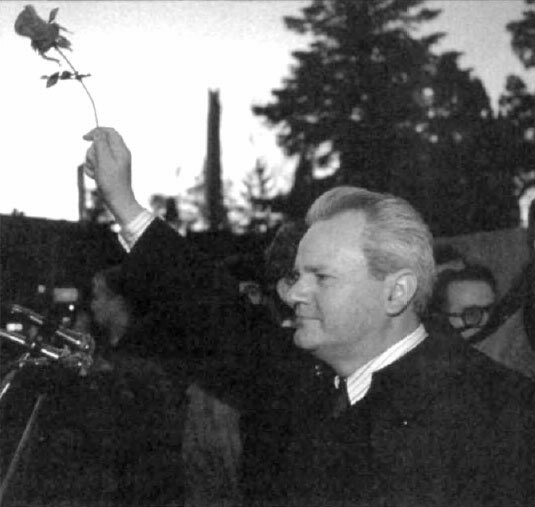 You will also find here a photo of former Yugoslav Serb leader Slobodan Milosevic, likewise holding a rose in his hand, the right hand. In Satanism the left-handed path is the most magical and powerful, but more evil. Clinton (left-hand) is still today recognized by the world as a great leader. Milosevic (right-hand) is in disgrace, in a prison cell, after being felled by Clinton and his Illuminati cohorts, proving that it's not nice to attempt to doublecross your Illuminati overlords, Mr. Milosevic! 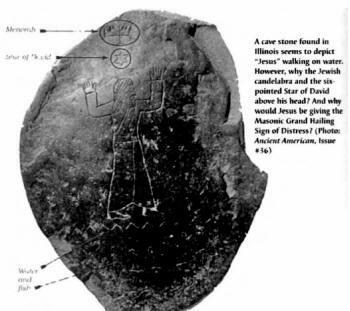 In this chapter you will find not only Bill Clinton, Slobodan Milosevic, John Kerry, and others giving enigmatic ritual messages, but, also, we will examine other signs in which the Illuminati signal with the arms and either or both hands. 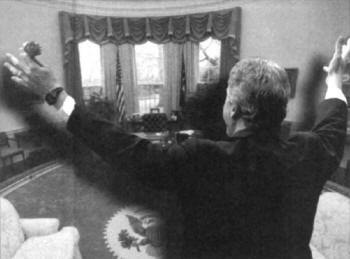 One classic Masonic pose, duplicated by or similar to that employed in many other Orders, is the Grand Hailing Sign of Distress. Theoretically, this is used in extreme circumstances in which a Mason or other elitist finds himself in a crisis or in a bind. In such an emergency he gives the Grand Hailing Sign of Distress, sometimes called the "High Sign." At that point, brethren who recognize the secret sign of alarm are expected to come to his rescue. Comically, mass murderer Charles Manson was observed giving this sign and a number of others during his trial for conspiracy to commit murder. Reportedly, Manson believed the judge in his case was a 33° Mason and would rescue him. It was all to no avail. Likewise, Mormon Church founder Joseph Smith gave this sign while under siege of a lynch mob at the Nauvoo, Illinois jail where he had been incarcerated. As Joseph Smith lay dying on the jailhouse floor, he cried out, "Is there no help for the Widow's Son?" This is the enigmatic saying taught Masons, stamping Smith as a follower of the Great Goddess, patroness of the Masonic fraternity. 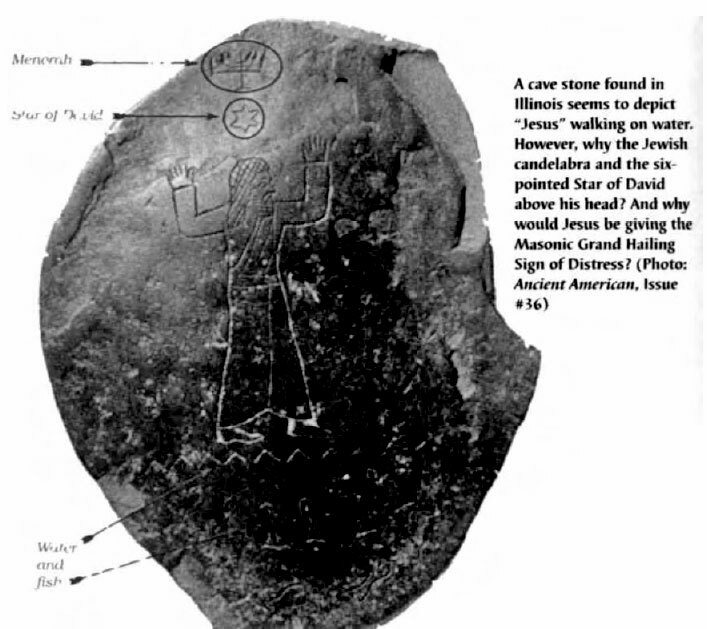 The Bible in Revelation 27 refers to her as "Mystery, Babylon the Great, Mother of Harlots." After brief ceremonies, the blindfold is removed, and the newly sworn Master Mason is taught several secrets of that degree. 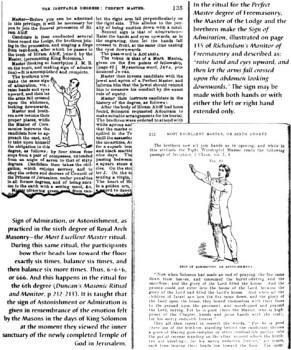 He learns the penal sign, the hand signal based on the penalty of the Master Mason's oath, which is to pass the hand in a slashing motion, palm downward and thumb toward the body, across his stomach. The due-guard of the Master Mason repeats the position of his hands on the Bible and the compass and square as he takes the oath: with his upper arms along his sides, forearms out straight, with palms down. Note that Robinson makes mention of the "penal sign, the hand signal based on the penalty of the Master Mason's oath." In Codex Magica, you will see several examples of this signal, including a photo of Soviet dictator Joseph Stalin and one of former House Speaker Newt Gingrich. "a kind messenger from the Supreme Grand Master will be sent to translate us to that all perfect, glorious and celestial lodge above, where the Supreme Architect of the Universe presides." All officers and members bow toward the East. The Master raps the lodge down (1 rap). Also explained to the brother in the third degree lecture is what he is to do in times of peril or danger. He is instructed (if he can be seen) to throw up both arms over his head and let them fall by three distinct motions. This is the great hailing sign or sign of distress, and never should be given except in a lodge for instruction, or if his life is in danger. If a Mason sees this sign, he is to flee to his rescue if there is more probability of saving the brother's life than of losing his own. Mikhail Gorbachev, Soviet President and Chairman of the Communist Party, visits the Council on Foreign Relations (CFR) in New York City. The presiding head of the organization proudly shows him a copy of the very first edition (1921) of Foreign Affairs, the CFR's official journal which has annotated notes of Vladimir Lenin written by him personally on the margins of some pages. Lenin obviously was a servant of the llluminati, too. 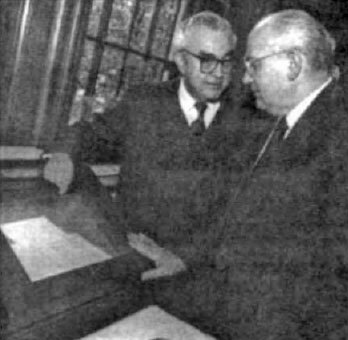 Note that the awed Gorbachev respectfully gives the Illuminist/Masonic Sign of Admiration and Astonishment with his right hand, only this time it is lain on the display case parallel to the "sacred" document to which his focus and devotion is directed. Satanic, muddle-headed rock'n'roller Ozzy Osbourne, who once bit the head off a bat at a rock concert and sometimes led altar calls for the devil, raises his hands at a White House dinner hosted by President George W. Bush and wife, Laura Bush. Osbourne was so happy to be invited, he arrived early. 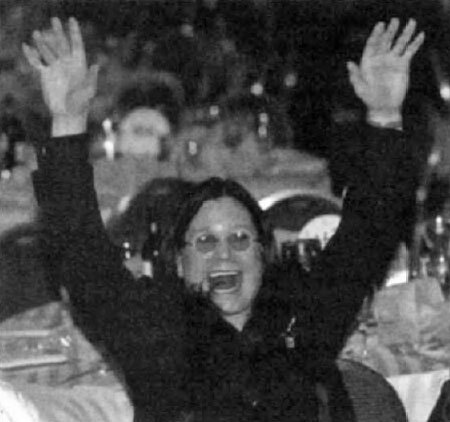 Bush, at the podium, publicly recognized and applauded Ozzy and told him how much Bush's mother, Barbara, enjoyed his albums! This is Senator John Kerry, arriving in Ohio for a campaign stop while running for President of the United States in 2004. See how Kerry's hands and arms are extended in salute to the sun, as its rays burst through the clouds. A sun worshipper? 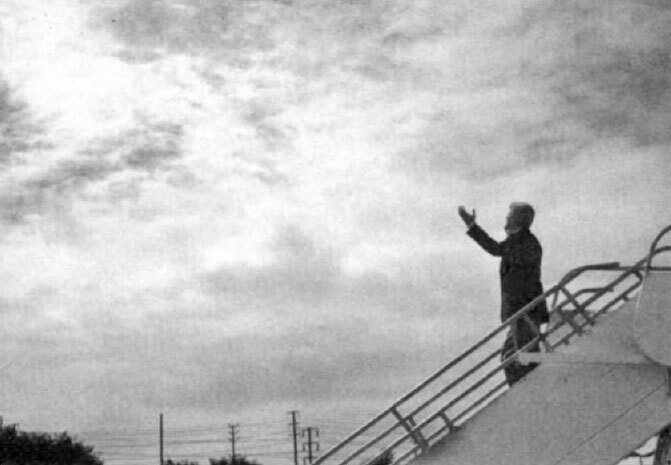 Strange, unless one understands that it is entirely possible Kerry was giving the Masonic sign of adoration and admiration to the one the scriptures call the "Prince of the power of the air" (e.g. Satan!). Interestingly, neither the caption of the Time magazine (March 15, 2004) photo nor the accompanying article gave any clue or mention at all of why Kerry's arms were outstretched in this position. 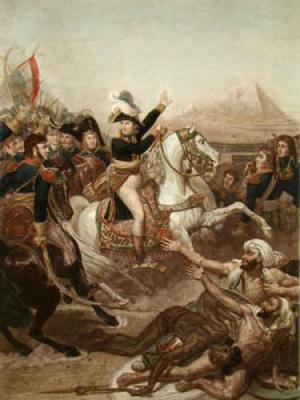 In this celebrated painting, The Battle of the Pyramids, by Baron Antoine Jean Gros, Napoleon is shown presenting the Masonic and Rosicrucian sign of astonishment or admiration at the sight of the marvelous sight of the pyramids of Giza. 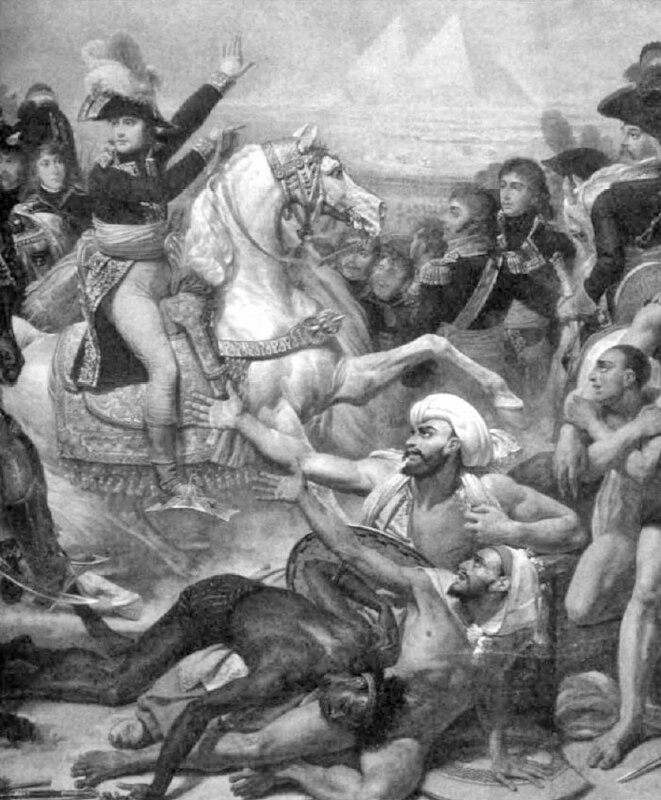 From written historical accounts, we know that the French Emperor did, indeed, experience feelings of amazement and admiration upon viewing the spectacle of the Egyptian pyramids. This particular sign can be accomplished either with the left or the right arm extended and the palm facing toward the object of admiration, or astonishment. 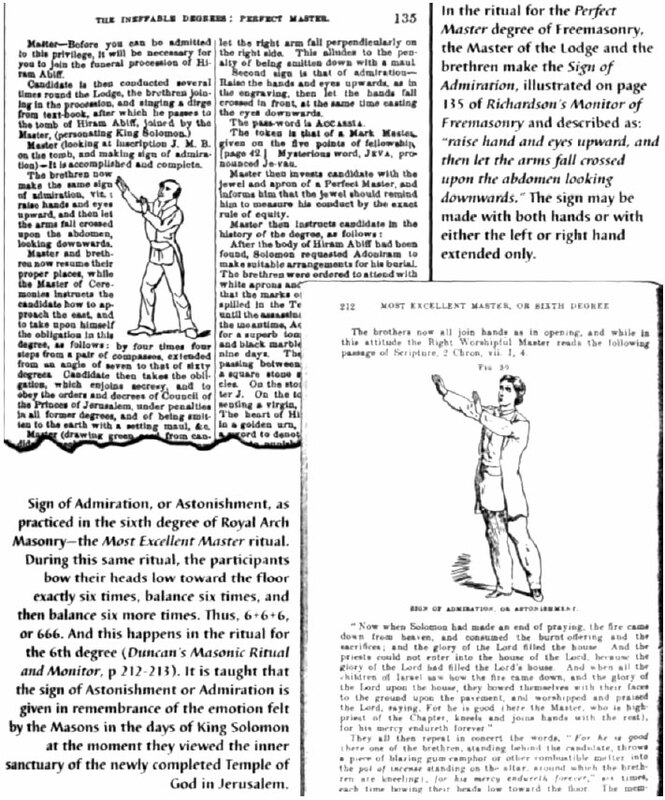 This illustration in Richardson's Monitor of Freemasonry (1860) shows the Master Mason giving the "First Sign, or Due Guard" with his hands upright "in the manner of giving the grand hailing sign of distress." 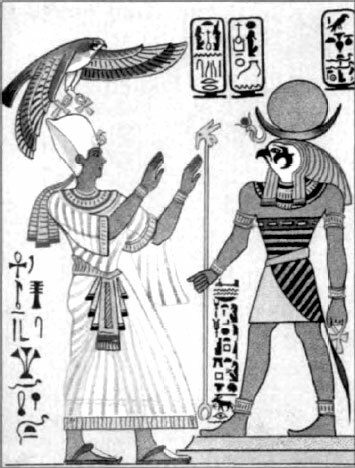 Compare this with the image inscribed on the cave stone above. 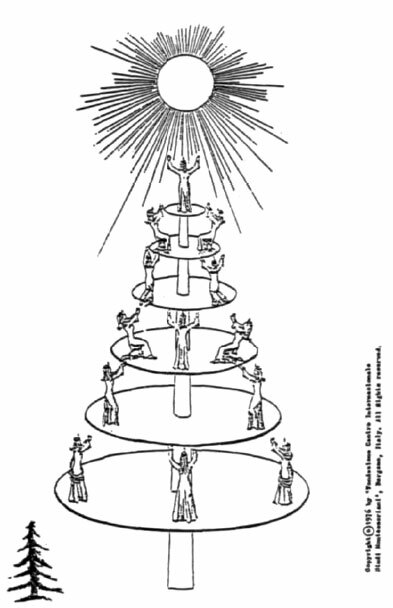 Instructional material for educators in the Fort Worth, Texas, Independent School District included this drawing of 13 Goddess worshippers (13 comprise a witches coven) on a succession of six circle platforms paying homage to the Sun. 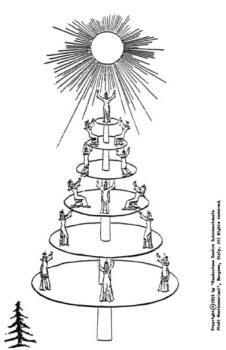 The illustration originally came from an Italian foundation dedicated to the work of New Age evolutionist and educator Maria Montessori. 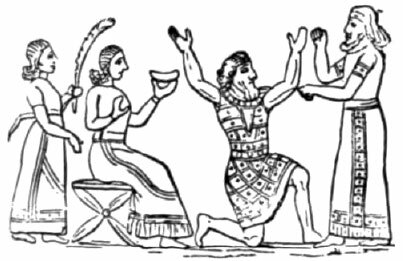 In the Babylonian religion, as the initiate entered into the "Mysteries," part of the ritual was the drinking from the cup of the Woman (the Goddess). Here, in this ancient woodcut we find a supplicant kneeling while raising his hands in submissive fashion after just drinking from the cup. 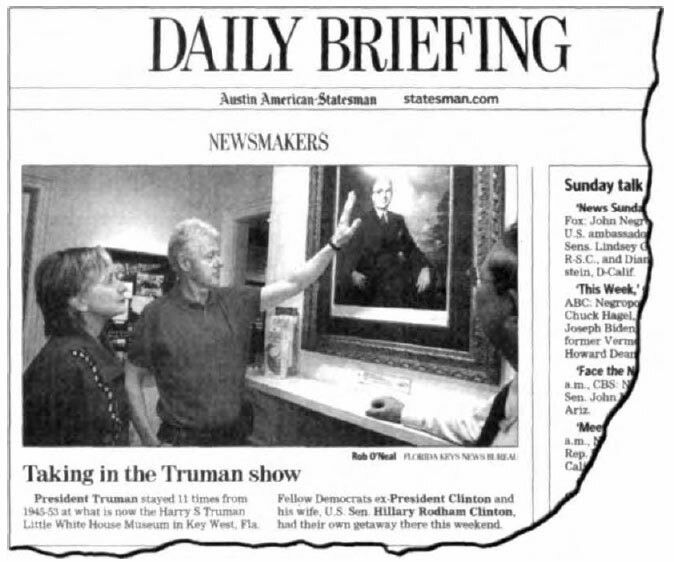 Former President Bill Clinton gives the Sign of Admiration as he views a painting of the late President Harry Truman. 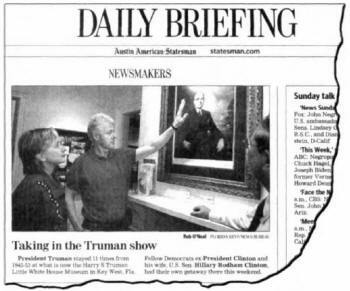 Both Clinton and Truman were initiates of the Masonic Lodge, and, by giving this sign, Clinton is acknowledging the Masonic achievements of his predecessor, Harry S. Truman, 33°. 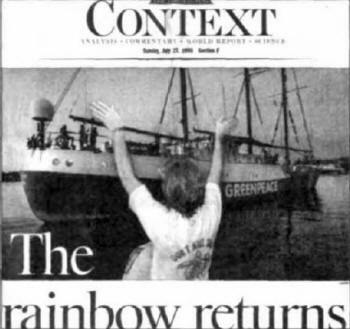 A dockside member of Greenpeace, the radical environmentalist group, hails the organization's sea-going vessel. Almost all environmentalist organizations are funded and run by the Illuminati. Members are ignorant of this behind the scenes influence.